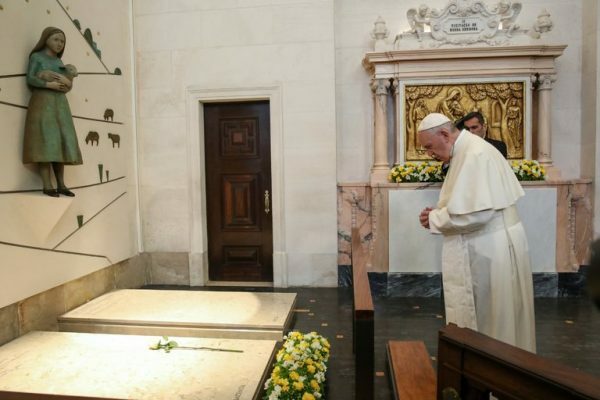 Pope Francis canonized two Portuguese shepherd children during a Mass on Saturday, a century after the children and their cousin said they first saw the Virgin Mary here. The children, Jacinta and Francisco Marto, along with an older cousin, Lúcia de Jesus dos Santos, told skeptical elders that they had witnessed six apparitions of the Virgin between May 13, 1917, and Oct. 13, 1917, when Jacinta was 7, Francisco was 9 and Lúcia was 10, according to the Vatican. After the Roman Catholic Church here validated the children’s visions, it turned Fátima into Portugal’s main pilgrimage site. The site is nowadays visited by more than five million people a year, many crawling on their knees the last few yards to a shrine of the Madonna. Organizers had expected as many as one million people to attend the Mass. In the end, 500,000 came, according to the Vatican, a drop that some attributed to the overcrowding concerns that the pontiff’s visit had generated. “It’s really unique to have a centenary, canonization and the pope all at the same time, so I think some people got scared about coming and not even being able to enter Fátima,” said José Ferreira, a priest visiting from Lisbon. To keep a prime spot for Saturday’s Mass, some chained their foldable chairs to the side railings. Traditionally, pilgrims walk at least part of the stretch to Fátima. Some then cross the esplanade on their knees, sometimes crawling, to reach the Chapel of the Apparitions. Lara Saavedra, 28, a nun and theology student, said she had walked about 13 miles to Fátima early on Friday and then spent the night on the esplanade, getting ready for Saturday’s morning Mass. In recent weeks, many local hotels had raised room prices to stratospheric levels. All along the access roads to Fátima, pilgrims set up makeshift camp sites. “Fátima doesn’t, in any case, have the logistical capacity for everybody, but the young are flexible and can adapt,” Ms. Saavedra said. The sanctuary is home to two basilicas, but its most important feature is the much smaller Chapel of the Apparitions, which stands where the Virgin is said to have appeared to the children in 1917, on the side of the esplanade. State employees were granted a public holiday on Friday for the pope’s visit. Many foreign pilgrims said they had planned to travel for Fátima’s centenary celebration before Francis decided to attend. Still, they said the pope’s presence made it far more special.